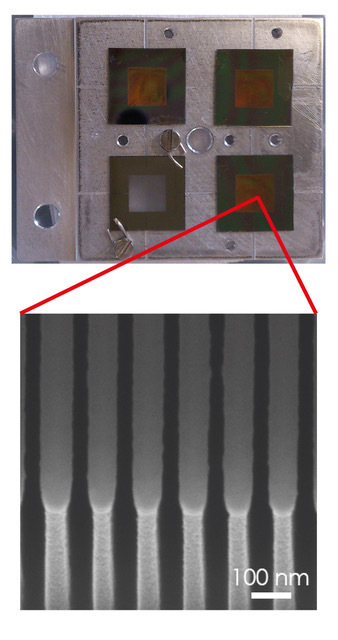 The reflection signal of the sample (left), corrected by the reference signal (middle) yields the progression of the demagnetization process (right) (picture: Buzzi et al.). The new method, which has been developed by scientists at the Pierre and Marie Curie University in Paris, the Paul Scherrer Institute in Villigen, the SOLEIL synchrotron, CNRS and DESY, therefore adopts a different approach. Instead of recording numerous images one after another, X-ray streaking captures the entire process by means of a single pulse of light. To achieve this, the researchers used parts of a Fresnel lens for X-rays, a so-called zone plate, to focus the light on the sample. However, instead of shining the light from the X-ray laser through the centre of the zone plate, they made it travel “off-axis” through an outer region of the lens. This means that although parallel beams of laser light striking the lens are focussed on a single point, at which the sample is positioned, light coming from a more distant region of the zone plate arrives at the focal point slightly later than light travelling through more central regions of the zone plate. Although this deflection of the beam prolongs the original laser pulse before it strikes the sample, the time at which each part of the pulse arrives at the sample is now determined by the angle at which it arrives. Hence a CCD X-ray camera placed behind the sample will record a different state of the sample at a position where the light reaches the sample early on to that recorded at a position where the light arrives later on. This trick therefore transforms the temporal sequence of the states undergone by the sample into spatial information in the detector. However, to interpret the sequence of events in the sample it is also necessary to know the spatial intensity profile of the incident light pulse. This needs to be determined for precisely the same pulse as was used to illuminate the sample, because the SASE process used to produce X-rays in free-electron lasers means that every individual pulse has a different profile. The scientists found an elegant solution to this problem: in addition to the laser light that is focused on the sample as a positive first-order diffraction beam, they captured the negative first-order diffraction beam, which diverges from the optical axis, using a second CCD camera. This method not only allows them to determine the illumination profile, but at the same time corrects artefacts created by flaws in the zone plate. Photo and zoom-in of a zone plate (picture: Buzzi et al.). The scientists tested their new experimental technique using a thin film of cobalt, in which they triggered a rapid demagnetisation with the help of an external laser. By measuring the demagnetisation over a period of some 1.6 picoseconds (or 1600 femtoseconds) the group was able to reconstruct a relaxation time of 130 femtoseconds, during which the electron spins rearrange themselves. 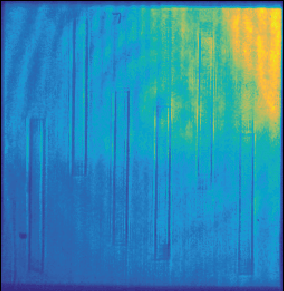 “The difference between the sample and the reference signal shows excellently how the material’s reflectivity for X-rays changed over time after being triggered by the laser pulse,” explains the last author Jan Lüning (Pierre and Marie Curie University). “Although we have proven the capability of X-ray streaking studying a rapid magnetisation event, our technique is completely general and capable of achieving extreme time resolutions. I hope many different experiments in the field of ultrafast chemistry and warm dense matter will take advantage from it,“ says Michele Buzzi (Paul Scherrer Institut, now at Max Planck Institute for the Structure and Dynamics of Matter). The new experimental technique is particularly suitable for processes in which the original conditions cannot be perfectly recreated and in which classical pump-and-probe experiments come up against their limits.